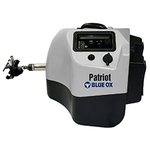 The Patriot from Blue Ox gives you the comfort needed for when you’re braking your tow vehicle. Not only is it convenient and easy to store, but it also proportionally applies the brakes while you’re slowing down to a stop, instead of suddenly jolting your tow vehicle causing costly damage to your brakes. All Blue Ox braking systems come with a one year warranty. The Patriot works for you motorhome and tow car by safely bringing it to a smooth stop with proportional braking. 1. Why does it say reposition brake? The Patriot brake will tell you "reposition brake" when it does not sense enough resistance from the brake pedal. This happens when the brake fully extends its arm and is unable to apply the desired amount of pressure on the brake pedal. The two most common causes of this error are a soft drivers seat, and/or a large distance between the seat and the brake pedal. The first step to fixing this problem is to make sure that the seat is as close as possible to the back of the Patriot brake when the unit has its claw attached to the brake pedal and its arm fully retracted. 1. With the brake plugged in but powered off, hold down the SETUP button while powering on the unit. Once it lights up you can release the setup button. 2. Once it is finished initializing, the screen will read “MODE: FORCE”. Hit the JOG switch to the left so that the screen now reads “MODE: POSITION”. Press SETUP to select this setting. 3. The next screen will read, “MAX FORCE” Press SETUP again at this screen. 2. How do you set up in a Jeep Wrangler / Jeep Grand Cherokee? To set the tow brake up in a jeep vehicle (wrangler / Liberty / Grand Cherokee) There are a few important things to keep in mind. Third, If the unit cannot be positioned properly on the seat, you may need a seat stiffener plate to improve the connection between the back of the brake and the seat. 3. Why does the Patriot send an error 8 message when you go over bumps? This is not a real error with the brake. What is happening is that the RF controller is not tightly plugged in, and the RF controller is losing power momentarily. When it turns back on it beeps twice and the LED display lights up the whole grid. (It looks like an 8) The problem is with the remote control and the 12v outlet. The first step in fixing this is to make sure the cap on the end of our plug is securely tightened all the way. The second step is to make sure that the RF controller power cord is pushed into the outlet all the way. Again, this is not an error being displayed, it is simply the remote powering back on. 4. The seat is very soft, what do we do? 4. The brake should read “SETTINGS SAVED!” and automatically restart. If you are still not getting enough force on the brakes, there is an optional attachment available called the seat stiffener plate. This will increase the contact area between the brake and the seat and will provide a firm surface for the brake to push on. 5. What does it mean when the RF is flashing a C? Communications error (Remote Unit not receiving radio transmissions from Control Unit). This means that the RF controller has lost communication with the brake unit. This may happen occasionally, especially in larger motor homes with the engine in the back. NOTE: The Patriot brake will continue to function normally while there is a communication error. The only part affected is the RF Controller's display in the motor home. 6. Does the brake away light stay lit all the time? Yes, the Brake Away light will turn on when this feature is plugged in and ready to be used. This light will stay on all the time, and if there is an actual brake away event, then the error light and a constant beep will come on as well. 7. How do I know if the brake is actually functioning? You can tell if the brake is actually functioning by looking at the wireless RF controller. 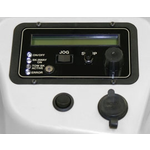 When the brake is on and ready to be used, the RF controller will display a solid number 0-9 (depending on the current gain setting). 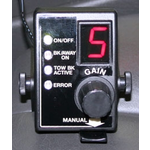 When the Patriot brake activates, then the "tow brake active" light will turn on and stay on until the braking event is over. 8. How do I know if the brake is set up and ready to use? You can also look at the brake unit's display to see if it is ready to be used. The display will read READY* and display the current gain setting. 9. Can I use this brake with a hybrid and continious power assist brakes? Yes. In order to use the Patriot brake with a hybrid or with continuous power assist brakes you need to switch the brake over to position mode and turn the gain setting down in the range of 1-3. 10. Does the Motorhome brake system activate the Patriot or is it activated with the manual override lever only? The Patriot works very simply and is activated with inertia. That means that you need to be moving for the brake to apply and there is a certain deceleration force that must be created before the brake will apply. The manual lever on the RF controller can also be used to activate the brake.